Introducing Our New CYA Track Director! We are pleased to announce that a NEW CYA Track Director has stepped up from among our CYA Track Family! This means that there will be a 2018 CYA Track season and beyond. The baton is being passed! Jen Flebotte (pronounce Fla-bow) is the mother of three boys, an 11th-grader on the Chantilly Track and Cross Country team (and one of CYA Track's hardest-working volunteers) and an 8 and 4 year old, both of whom will be running in the program. Jen is also an avid runner herself and has the intention to carry the program forward for many years to come! 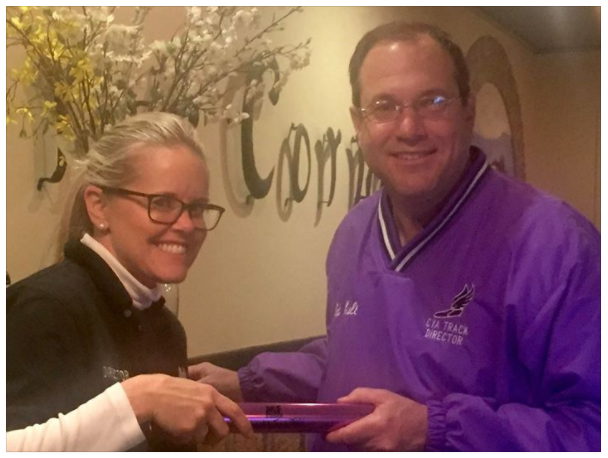 We are so grateful to Ed Lull (Pictured above with Jen) for all of the years that he has put into growing and running the CYA Track program. Ed has worked closely with Chantilly High School in an effort to establish a top rate facility and his ability to obtain "donated products and services" is legendary! The CYA Track program has nearly 300 participants every spring and there is no doubt that without Ed's effort, we would be no where near that number. We are so pleased to know that Ed will still be in the background aiding Jen and her team as they become acclimated to the grind that all Over-Achieving Volunteers go through daily! THANK YOU ED for everything you have done for CYA and our community. The positive impact you have made on so many young people is immeasurable and we will never be able to thank you enough! 2019 CYA Track Schedule will be posted SOON in Related Links. We are preparing for another exciting CYA Track Season that will start in March, 2019. Our Spring 2019 Schedule is Posted to the right in RELATED LINKS. We will be updating the website frequently so be sure to check back! All practices and events take place at the Chantilly High School Track and surrounding fields unless otherwise noted. Keep an eye on the schedule for additional details. Online Registration for the Spring 2019 CYA Track Season starts on January 1st, 2019!